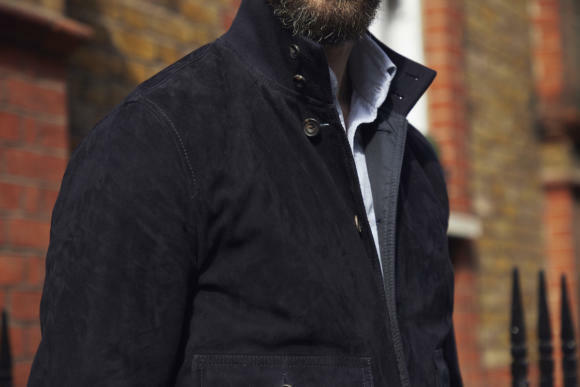 The Valstarino - Valstar’s button-up suede blouson - has been very popular among fans of classic menswear in recent years. Although that shouldn’t be generally surprising given its quality and heritage, I do think it’s become particularly popular because it fits so well into a tailored wardrobe. The suede, the slim pockets and (most importantly) the button-up front make it unusual among blousons in being smart enough to substitute for a tailored jacket. It can work with the same shirt and flannels you might have worn to the office, but be rather more casual - perhaps swapped for that jacket in order to meet friends down the pub. And it works well for travel. Wear it with that same shirt and trousers to get on the plane, and have a blazer folded up in carry-on. However, one thing I always thought would increase the Valstarino’s usefulness would be to make it weatherproof. Although it’s not as hard to care for suede as people think (see our video here) I do know that the suede puts potential Valstar customers off. So at the beginning of last year I started working with Matteo at Valstar to develop a reversible version of the jacket. One with a really quality, breathable waterproof layer inside (Loro Piana Storm System) and an easy method of reversing it. This was initially just a made-to-order project for myself, but after a while it seemed obvious we should make a small run to offer to readers as well. There aren’t many, therefore: just 35 pieces. But if it goes well we can always make more. 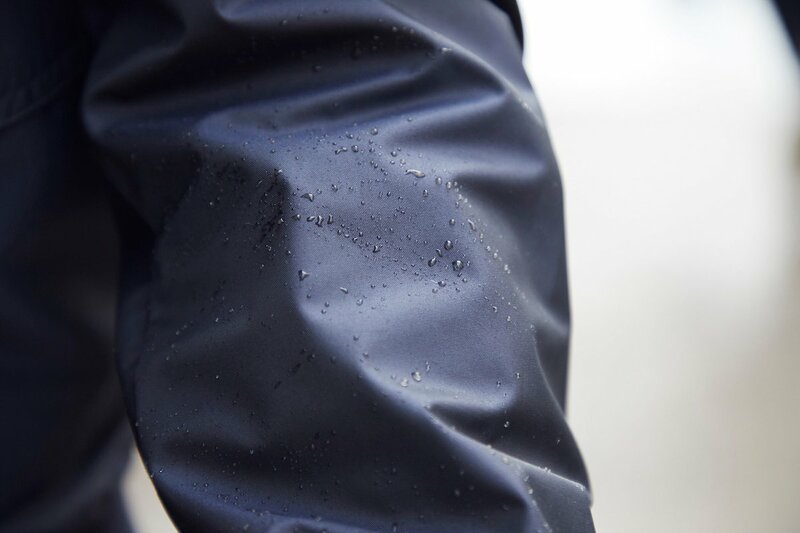 The Storm System layer is of course entirely waterproof yet breathable (particularly important when it’s the lining - you get rather sweaty otherwise). In order to reverse the jacket, each button has an extra buttonhole next to it, enabling you to push them through to the other side (see illustration below). This means the reverse side buttons-up left to right, rather than right to left, but the only alternative is to have a line of buttons on both sides of the jacket, and this doesn’t look great. Suede also doesn’t make the best lining for a jacket, as it has such friction. But the jacket isn’t designed to have two wearable sides, to swap for different looks. Rather, it is designed to have a waterproof option at all times, so you can wear it in the morning without any fear of getting drenched later on. Another change I wanted to make was the buttons themselves. Polished buttons might be more Italian, but they’ve always looked a little cheap to me. I prefer unpolished horn, as is traditional on Savile Row and as we used on our Bridge Coat with Private White VC. So the buttons on this version of the Valstarino are matte dark-brown horn, and two-hole buttons for good measure. Another thing you rarely see outside the Row. 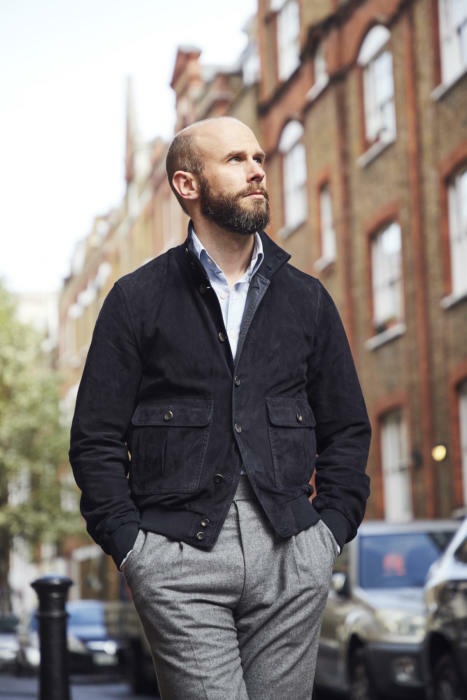 As to colour, although I love brown suede, navy is the perfect colour to play that jacket-substitute role in a modern sartorial wardrobe. Travel in a navy Valstarino, pack a navy blazer, and you’ve got the great foundations of a great travel wardrobe. 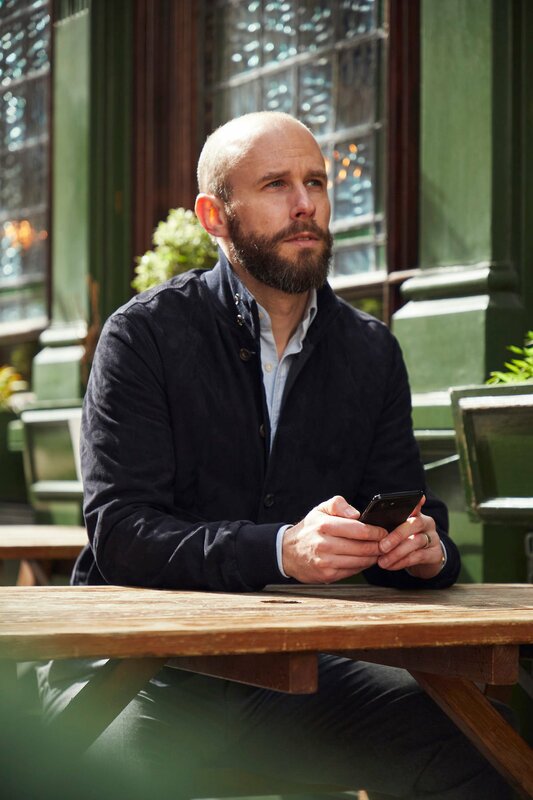 In the pictures here, taken around Fitzrovia, I’ve deliberately worn the Valstarino with the same PS Oxford shirt (just restocked by the way) and Saint Crispin's brown-suede boots - but swapping between flannels and jeans. This means you can see how it works with both types of trousers. 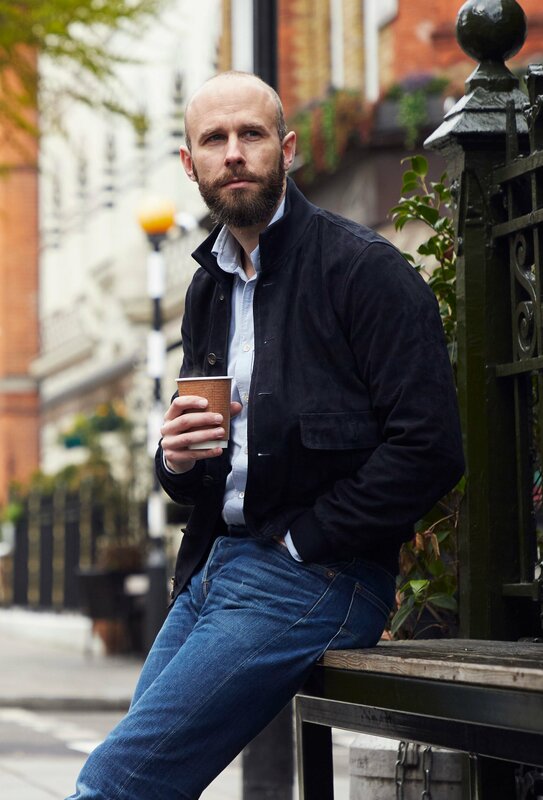 Indeed, if the navy blazer were a casual, small-shouldered Neapolitan cut, and therefore worked with the jeans as well, you’d have four different levels of formality and style: blazer/flannels, Valstarino/flannels, blazer/jeans and Valstarino/jeans. Add in a knit navy tie to create one more option at the top of the formality scale. Or a pair of slim white trainers for another option at the bottom. In every other respect, this version of the Valstarino - which is exclusive to Permanent Style - is the same as the classic style. Same materials, ribbing and suede, and same details. The fit is the standard for the Valsarino in Europe, sometimes referred to as the slim fit (the model stocked by Mr Porter, Trunk Clothiers etc). I am wearing a 50 in the pictures, which is a nice fit over just a shirt. But were I to regularly wear knitwear underneath, I would size up to a 42. I would suggest that if anyone wears sizes generally that aren't a slim fit, they should size up. Full measurements are also available on the shop page here. The Storm System and the jacket's reversible nature make this more expensive than other Valstarinos, as it's essentially two jackets finished together. It comes out at £950 including VAT, but I think worth it for the extra functionality. It is available in sizes 46 to 54, on the shop site here. You can follow the discussion on Introducing: The reversible Valstarino by entering your email address in the box below. You will then receive an email every time a new comment is added. These will also contain a link to a page where you can stop the alerts, and remove all of your related data from the site. Look like your St Crispin Chukkas to me ? Ha ! I’m not a weirdo, by the way but have the same ones and that little cream bar tack is very distinctive ! Does the trim is still 44% acrylic (as mentioned on MR Porter)? I wonder if this trim is not going to be the one that causes jacket to be no longer wearable. Great idea. Also a great pity inasmuch as I presume that there is no prospect of Valstarino offering this on a MTM basis (as PW do) to allow for extra sleeve length? Hi Simon. Beautiful project as always. Just to quick questions: you mention you are wearing a size 40, but sizing starts on 46. I take it you mean a size 50? Also, you say its 745 pounds plus VAT, but the shop shows 792. Not a big difference but thought you should know. Will order mine! Hi Juan. Good spots both, thank you. Yes, I’m wearing a 50 not a 40 (thinking English sizing) and yes the price should be 792. I’ll update now – thanks again. I have a valstarino jacket that is to long in the sleeves, would you recommend shortening sleeves on a suede jacket? any chance of producing a size 44 for the next batch? They come up rather small, Paddy. It’s probably worth you trying a 46 unless you already have a slim-fit Valstar product in 44? 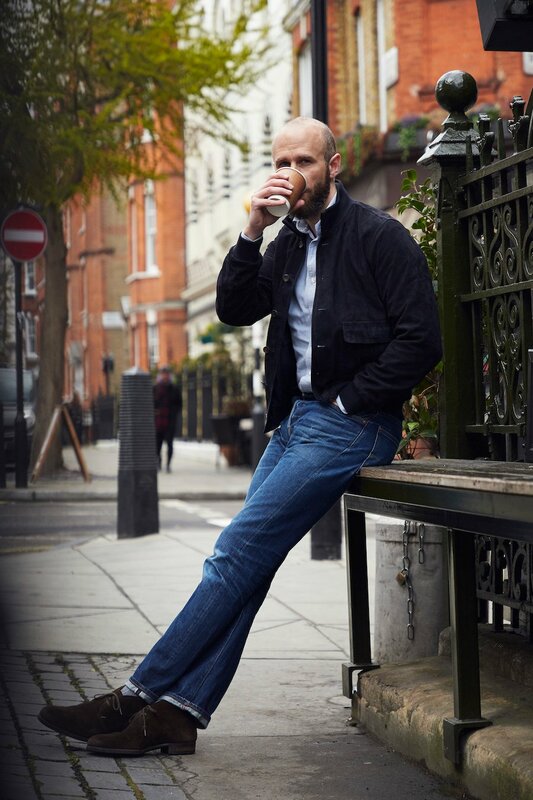 Yes, I’ve tried both the 44 and 46 in the slim fit unlined Valstars from Mr Porter. They both fit well but I prefer the 44’s length. You mentioned there could be a re-order if it goes down well? I’m not sure how many have sold as of now but whats the chances of making more? If so, can I put a order in for 44 in the next batch? Ah, ok that’s good to know Paddy. We’ve sold most of them now, so it’s going well. And perhaps we should consider a pre-order for next time in different sizes if the timing works out. Perhaps drop the Support@PermanentStyle.com address a line saying you’d like that, and we’ll keep it on record for the next batch whenever that happens. same here! 44 for the next batch please. Based on these photos, I assume the Storm System layer is just the waterproof part that Loro Piana uses in Storm System; it’s not a wool layer with the waterproof layer underneath? Or are the photos deceiving me. No you’re right – Storm System is the waterproof layer, and then on other jackets it is bonded to the wool or cashmere. Storm System may be breathable but suede isn’t. Surely if you reverse the jacket the suede will make you sweat with the attendant risk of the suede staining ? Hi. True, but the point is that it’s the same experience as an unlined suede jacket – which is what Valstarinos usually are. And I’ve never had a problem with staining my Valstarinos, or indeed any other suede jackets. Yes, but this time you are adding Storm System as an outer layer ! That will be a whole different dynamic. Hopefully you have road tested this with a couple of perspires. I have, yes. This has been in production for a year and gone through road testing of several prototypes. But there is little difference, given the Storm System is so breathable and as I said it’s not an issue with Valstarinos normally. Great idea. Nothing worse in London than coming out of the Tube in a suede jacket to find the weather has turned! Didn’t want to pick pink stripes so people could have the Seinfeld experience? You said you are wearing a 50, would that generally be your OTR size or are you closer to a 48? This, coupled with the measurements on the site, would really help nail down a size for me. Thank you! In suits I’m usually a 50 on the chest and shoulders, and a 48 in the waist. So I’m often looking for a slim fit, or having the jacket taken in at the waist. Here a 50 is just about OK, but I might take a 52 so I have room for knitwear underneath. If in doubt I would size up. Hope that’s helpful – if you have any other questions let me know. Another interesting and useful collaboration. Any chance of doing a run in dark brown suede with a waterproof lining? Great thinking and fine product. 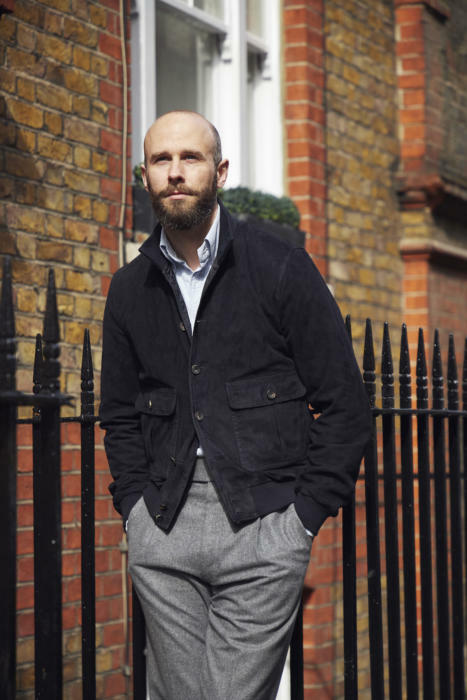 I have a jacket utilising Loro Piana’s Storm Sytem. It’s great and being reversible adds greater utility. 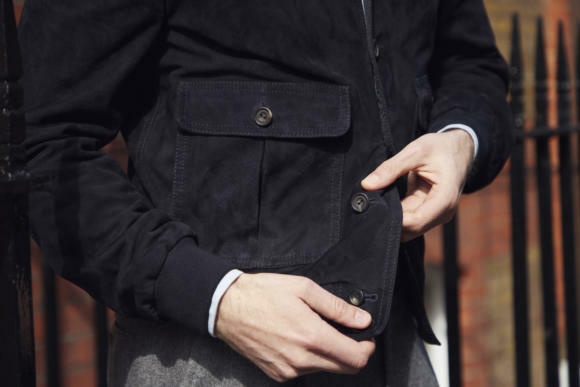 I would not have added patch pockets, aesthetically they add too much bulk to the front on what is, essentially, a blouson style. Nonetheless a nice silhouette . For reasons of practicality it would have been good to see how it also looked over light knitwear or a shirt/tie. Dear Simon, great project! But I need some advise for the sizing. Chest 50 and shoulder 44 would mean 48, you recommended to size up….doesn´t it become too wide and boxy in 50? Good idea, execution and pricing. Is the suede calf skin? Simon are you drinking coffee from Attendant? I love functional outwear so this is genius – I’ve coveted a Valstar for some time but have concerns as I’m not slim (42) or tall 5’9” and wonder if those pockets + cutting the silhouette at the waist won’t help with either – any thoughts on this? Any suggestions for a jacket like the Valstarino but with a high armhole? I love the Valstarino jackets but find the armholes very low. Looks like another beautiful product—and practical as well! I got a bridge coat size 50. Sleeves were a touch long (I had them shortened) but otherwise a great fit. Would size 50 be the one to go with for the Valstar? Are the sleeves similar length? My one concern is that shortening suede might be more complicated than wool. Shortening it won’t be that easy, no, but should be possible. In reality, I’m probably between a 48 and a 50. I originally got a bridge coat in size 48, which would have been fine with minor alterations for wearing over a shirt, but was hopelessly tight over a suit jacket or sports coat. So I sized up to 50, which fits nicely over a suit jacket or sports coat. But in the case of the Valstarino, I would probably want to wear it directly over a shirt, or at most, over shirt and a fine gauge thin merino sweater (like your green permanent style crew neck). So based on this additional info, do you think I should go for a 48? 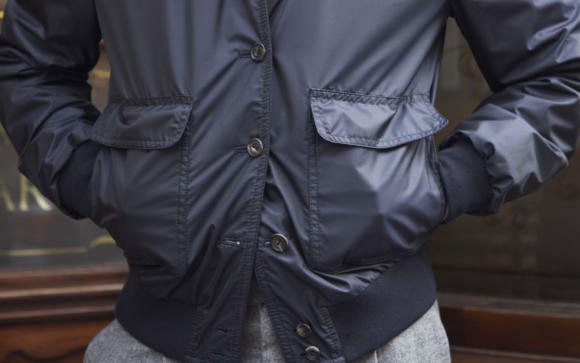 Great idea to add a weatherproof lining to the Valstarino jacket. Interesting to read that many potential customers are put off by the suede leather. I acquired the Drake’s version of the Valstarino in unlined light brown suede and the material and unlined construction are attributes that i explicitly seeked and like. 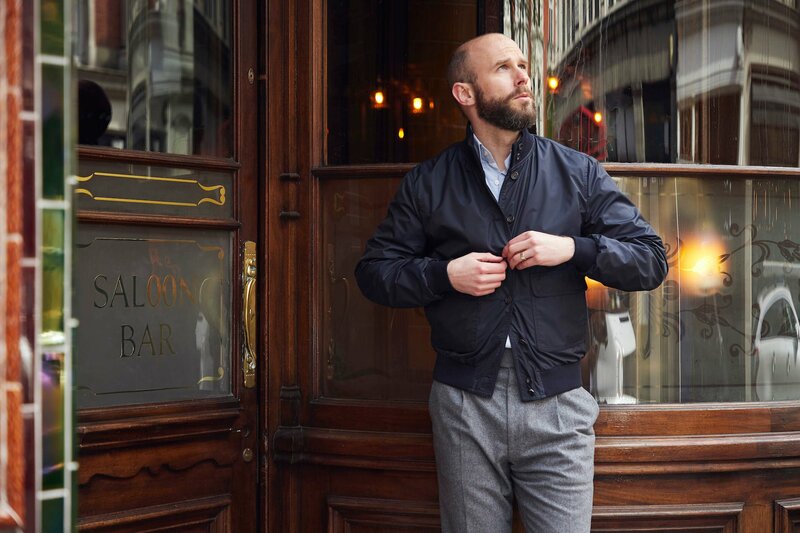 To say, that if i travel, i almost always wear my waxed cotton jacket, so the Valstarino is more of an casual yet elegant alternative to a sports jacket on work days. But i reckon that adding a weatherproof lining will make this jacket interesting for customers with a more diverse demand towards spring outerwear. I was wondering whether we could try it on anywhere in central London please? Also sent an email but did not get any reply yet. A bit off topic, but what do you think of suede safari/field jackets? Would you wear one? Thanks! This jacket is fabulous as is but I think another option with dark brown suede and the same navy waterproof lining would also look great. Apart from the fact brown and navy are my favourite combinations, it would differentiate the jacket even more, so it really looks like you have two different ones. By the way your navy one with jeans, oxford cotton button down and chukkas looks perfect (I have a pair of Tod’s navy desert boots ready to go!). A navy cashmere roll neck would also look super. Best. Rob.